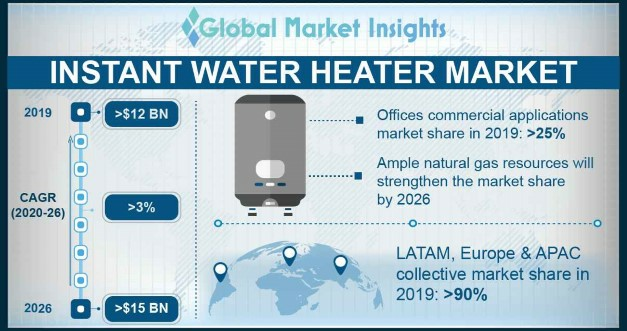 Instant Water Heater Market size was valued over USD 11 billion in 2017 and the annual installation is projected to surpass 75 million units by 2024. Rising disposable income coupled with growing consumer concerns toward sustainable use of energy will propel the tankless water heater market growth. Technological developments along with increasing R&D activities have led to the development of energy efficient instant heating solutions. In addition, stringent norms pertaining to the adoption of energy efficient electrical appliances across the commercial and domestic establishment will further encourage the product adoption. Ongoing expansion of commercial infrastructure on account of escalating economic development primarily across emerging economies will fuel the tankless water heater market growth. Worldwide smart cities roll out along with rising government investments toward development of zero emission buildings will stimulate the product demand. In 2018, Asia Infrastructure Investment Bank (AIIB) have given its consent for the funding of USD 100 million in NIIF India for supporting the infrastructure development across the country. The electric water heater market size is predicted to grow on account of quick accessibility to electricity coupled with substantial savings in energy bills. On demand hot water supply along with effective monitoring and control features eliminates the hassles of managing the heating system. In addition, high heating output with limited standby losses in comparison with conventional storage heaters will positively influence the business outlook. Easy accessibility of gas coupled with competitive pricing when compared to other alternate fuels will drive the gas water heater market growth. The system supplies higher capacity of hot water per minute when compared with the electric substitutes. In addition, leverage of reliable hot water supply across region with frequent power outages will further complement the industry landscape. Ongoing replacement of conventional water heaters on account of growing stringent norms toward the adoption of energy efficient heating appliances across residential properties will stimulate the tankless water heater market growth. Low running cost coupled with continuous and reliable hot water delivery will boost the product demand. Furthermore, additional features including multiple communication option, remote monitoring, Wi-Fi connectivity and voice activation will positively influence the industry outlook. Rapid development across the tourism industry coupled with growing demand of hot water across hotels and resorts will stimulate the instant water heater market size. Stringent government directives for the adoption of efficient water heaters across federal buildings and hospitals will complement the business landscape. In addition, increasing consumption primarily across multistory buildings along with ongoing expansion of educational institutes will encourage the product penetration. 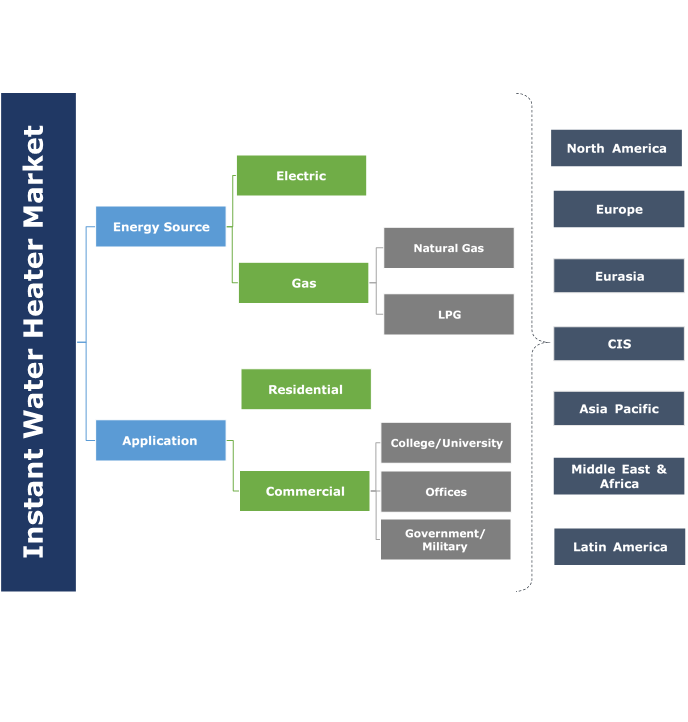 Escalating demand from commercial establishments on account of rapid expansion of service sector will foster the Asia Pacific water heater market growth. Availability of low-cost labor coupled with extensive manufacturing capabilities will attract number of investors across the region. Furthermore, ongoing government mandates to limit carbon emission will enhance the business outlook. Prevailing building codes and standards along with inflexible environment regulations will drive the Europe tankless water heater market size. Permanent hot water requirement on account of extreme climatic conditions will instigate the demand for cost effective heating solutions. Negligible standby losses coupled with low power consumption in comparison with storage units will further lead to product adoption. The Latin America tankless water heater market is set to grow over 2% in 2017. Ongoing technological advancement to produce fuel efficient heating technologies will augment the industry landscape. Long product lifecycle, reduction in water wastage along with less energy consumption will instigate the product demand. Eminent players operating across the tankless water heater market include Rinnai Corporation, A.O Smith, Bradford White, Vaillant Group, Rheem Manufacturing, Ferroli, State Industries, Bosch Thermotechnology, Linuo Ritter, Haier Electronics, Saudi Ceramics, Hubbell, Kanch Water Heaters, Viessmann Group, Ariston Thermo, Whirlpool and Jaquar. The eminent players of the industry are making strategic partnerships and collaborations with technology partners in order to gain technical expertise. The companies are expanding their operations across developing nations offering lucrative growth prospects and a large customer base. In addition, leading players are introducing innovative features to maintain a competitive edge over its competitors. Instant heaters supply on demand heating without the need of a storage tank. The system provides a continuous hot water supply throughout the day with minimum power consumption and significant cost savings. The running water through the pipes activates the flow sensors, bringing the system in operation. The water is heated as it passes through the heat exchanger, which can be either a gas or electric. The tankless water heaters find application across residential and commercial establishments. Further gas water heaters are deployed across areas with large hot water requirement owing to high heating output and mass flows in comparison to electrical substitutes.